This band was formed in 2005 by Ernie Landes and Sid Gire in an effort to spread the joy of Dixieland Jazz to the folks in and around Sun City, Arizona. The present lineup has been together since 2009, and has been fortunate to appear at community events, retirement homes, local festivals and watering holes throughout the greater Phoenix area. 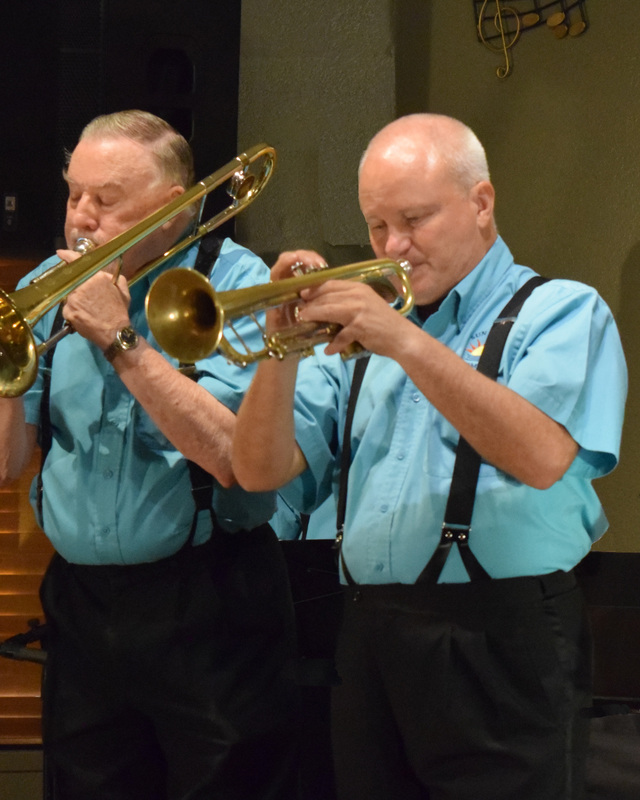 They are well into their third year of regular performances at the Sunset Bistro at the Lakes restaurant in Westbrook Village, Peoria, Arizona. The Stomperz made a conscious decision to concentrate their repertoire on the music of the first three decades of the Twentieth Century. This period includes the very beginnings of the traditional jazz age, the rise and fall of the Storyville District of New Orleans, the first jazz recordings and the resulting global appreciation of this music. Because several of the members grew up listening to the music of Lu Watters’ San Francisco style jazz revival in the 1940’s, the Stomperz play many of his compositions as well. The music that Joe “King” Oliver produced during the “roaring twenties” formed the backbone of what we know today as Traditional Jazz. He introduced amazing musicians, some of whom, like Louis Armstrong, will live forever. His recordings were wildly successful, spreading the good news far and wide. It is for these reasons that the Stomperz dedicate their album to the memory of Lil Hardin, Louis Armstrong, and Joe “King” Oliver.